Պրոտիստները բաժանվում են խմբերի` ըստ շարժման ձևերի. Tsukii, Y. (1996). 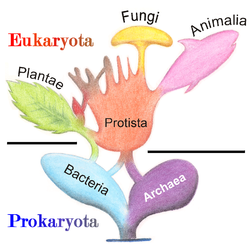 Protist Information Server (database of protist images). Laboratory of Biology, Hosei University.. ստուգված: Մարտ 22, 2016. Է. Հեկկել Das Protistenreich. Լայպցիգ, 1878. Հաուսման, Հուլսման Protistology. Schweizerbart'sche Verlagsbuchshandlung, Շտուտգարտ, 2003. Մարգուլիս, Handbook of Protoctista. Jones and Bartlett Publishers, Բոստոն, 1990. Մարգուլիս, Շվարց. Five Kingdoms: An Illustrated Guide to the Phyla of Life on Earth, 3rd ed. Նյու-Յորք,Ֆրիման, 1998. Մարգուլիս, Չամպան. Kingdoms and Domains: An Illustrated Guide to the Phyla of Life on Earth. Ամստերդամ: Academic Press/Elsevier, 2009. Schaechter, M. Eukaryotic microbes. Ամստերդամ, Academic Press, 2012.